Bella Circo is an Innovative Aerial Entertainment Company that specializes in creating new and original productions for special events. Co-Founders Sara Toney and Terril Teran, both veteran performers and skilled costume designers, have merged their talents to develop a unique approach to the entertainment experience. Combining high quality performance with stunning visual art; Bella Circo will captivate an audience and transform any ordinary setting into an extraordinary event. Bella Circo creates original entertainment for corporate events, weddings and private functions using experienced Aerialists, Hand Balancers, Contortionists, Dancers and Atmospheric Characters. These passionate artists will delight and inspire your audience with their remarkable expertise. 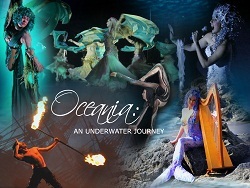 With breathtaking choreography, captivating music and expressive movement, immerse yourself in a world of wonderment!